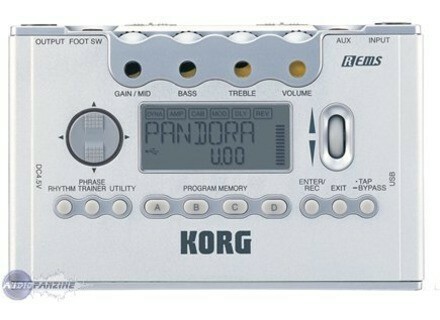 PX5D, Multi-Effects for Electric Guitar from Korg in the Pandora series. Korg announces updates to its Pandora PX5D personal multi-effect processor and USB recording interface for guitar and bass, further expanding the unit's capabilities. These updates are available as a free download from the Korg website (www.korg.com). Already PC compatible, the PX5D's Sound editor now also offers Mac compatibility. In addition, updated features include new "song updater" software that lets users either swap out some of the existing demo songs in the unit for new ones included in the software, or replace existing songs with their own favorite songs in SMF format. The PX5D is the latest release in Korg's Pandora series. The PX5D is the first computer-ready Pandora (via USB) for direct recording (Ableton Live Lite 6 Korg Edition recording software included). It also includes features such as footswitch control for live use. 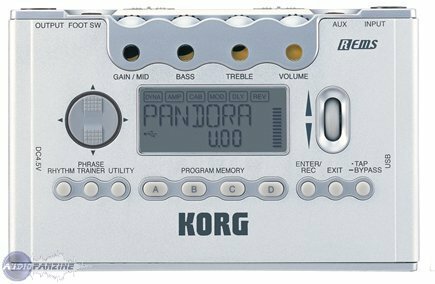 The Korg Pandora PX5D personal multi-effect processor and recording interface is currently available for a U.S. MSRP of $330. Reverend Jetstream 390 Hardtail Reverend Guitars keeps on revamping its classic models and now offers the Jetstream 390 guitar with tune-o-matic style bridge and stop tailpiece. Carr Amplifiers Raleigh Carr Amplifiers presents the Raleigh, a new low power combo amp with a rather original styling. Vox amPlug Lead VOX has added two new models to its amPlug range of palm-sized, battery powered, headphone guitar amplifiers: the amPlug Lead and amPlug Bass.